College Basketball 2015, Week Eight! The Spartans hadn’t played since before Christmas and opened the Big Ten season on Tuesday against Maryland (#12). Michigan State was defeated by two (2) points in double overtime, their third overtime loss this season. It was also coach Tom Izzo’s first home opener loss ever! Only five (5) of the top-25 teams remain undefeated at this early stage of the season. The Big Ten Conference only has three (3) teams currently ranked in the AP top-25: Wisconsin (#4), Maryland (#12), and Ohio State (#20). Next up for the Spartans this week, Indiana (Monday) and Iowa (Thursday). Go Green! Washington (#13) losing to unranked Stony Brook by five (5) points. Ohio State (#20) losing to unranked Iowa by six (6) points. Colorado State (#24) defeating unranked New Mexico State by only one (1) point in overtime. Maryland (#12) defeating unranked Michigan State by only two (2) points in double overtime. Louisville (#4) losing to Kentucky (#1). If you are looking for something a little different, here is a recipe that will dress up that plain old pumpkin pie. Pumpkin Persimmon Pie! I had to admit that when I was first presented with this idea, I was a bit skeptical (believe it or not I had never previously eaten a persimmon, so I had no idea what it would taste like), but the end result was just deliciously delightful! And it is such an easy recipe! I am now sold on persimmon and may never make another plain pumpkin pie again. Try it, you’ll like it! Combine eggs, pumpkin, persimmon pulp, condensed milk, sugar, cloves, ginger, cinnamon, and salt. Mix well. Pour the filling into your unbaked pie shell and bake at 350 degrees for 45 minutes (or until the center is firm). Serve with whipped cream. Here are a few oxymoronica on the topic of silence . . . enjoy! How about a little politeness (courtesy of the Goops)? Trivia in the Kitchen, Number Twenty-One! New Year’s Day is less than a week away and were you aware that around the world the New Year is welcomed with special foods in the hopes of bringing good luck? In Italy, it’s lentils and sausage; in Greece, a lucky coin is hidden in the sweet bread (hmm, sounds very similar to a Mardi Gras King Cake, to me); in Japan, they eat soba noodles which symbolize long life; in Spain, they eat twelve grapes at the stroke of midnight (one for each month). What foods do you consider “festive” or “lucky?” Black-eyed peas seem to be the food of choice here in Oklahoma (and the rest of the Southern United States). Here’s a link to an article on lucky foods for the New Year (courtesy of Epicurius.com). College Basketball 2015, Week Seven! The Spartans did not take long to fall from the top-25 — a loss (at home) to Texas Southern will do that to you. Wow, the Spartans already have four losses from their non-conference schedule. It could definitely be a long year for Spartan fans. Nine (9) teams ranked in the AP top-25 remain undefeated at this early stage of the season. The Big Ten Conference has three (3) teams currently ranked in the AP top-25: Wisconsin (#6), Maryland (#15 ), and Ohio State (#21). Next up for the Spartans this week, their Big Ten opener against Maryland (Tuesday). Go Green! Arizona (#3) losing to unranked UNLV by only four (4) points. Texas (#9) losing to unranked Stanford by only three (3) points in overtime. Kansas (#10) losing to unranked Temple. Wichita State (#11) losing to unranked George Washington by six (6) points. Ohio State (#12) losing to North Carolina (#24). Oklahoma (#15) losing to Washington (#16) by only two (2) points. San Diego State (#19) losing to unranked Cincinnati. Miami (#20) losing to unranked Eastern Kentucky. Butler (#23) losing to unranked Indiana . Michigan State (#25) losing to unranked Texas Southern in overtime. Arizona (#3) defeating unranked UTEP by only five (5) points. Villanova (#7) defeating unranked Syracuse by only five (5) points in overtime. Wichita State (#11) defeating unranked Hawaii by only one (1) point in overtime. St. John’s (#20) defeating unranked Saint Mary’s by only six (6) points. Baylor (#22) defeating unranked Southern by only four (4) points. Here is a simply awesome rendition of the song “Mary Did You Know?” courtesy of the group Pentatonix. Merry Christmas one and all! The word I discovered this week, has led me on the trail of numerous related words — a bit of a patulous discovery, if I do say so myself. 1. spreading, as a tree or its boughs. 2. spreading slightly, as a calyx. 3. bearing the flowers loose or dispersed, as a peduncle. 1. a flower stalk, supporting either a cluster or a solitary flower. 2. the stalk bearing the fruiting body in fungi. 1. a stalk or stem; a stalklike part or structure. 1. a stalk like structure composed of white matter, connecting various regions of the brain. 2. an attachment process, as in the brachiopods. 1. the outermost group of floral parts; the sepals. Necktie of the Month – Holiday Bonus! I probably should have highlighted one of my several holiday neckties as the official “necktie of the month” for December, but alas, I did not. So, here is a bonus necktie post to correct this oversight. 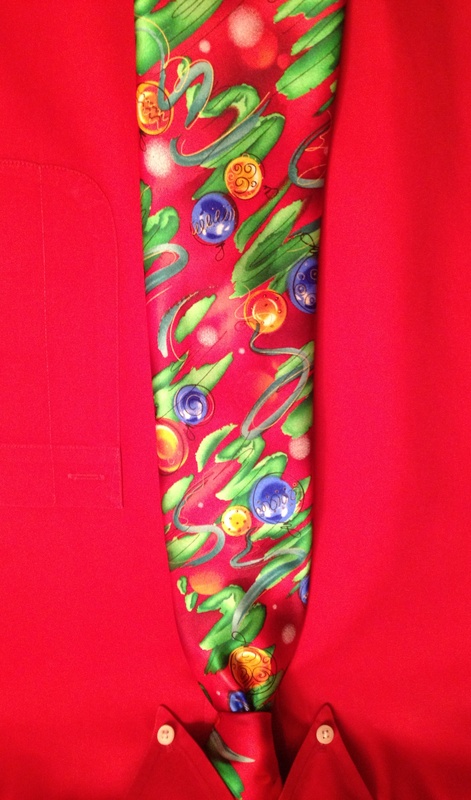 This is one of my newer acquisitions, a Jerry Garcia holiday tie entitled “Creme de Menthe Hangover” (what fun!) With a title like this, one certainly can ponder whether the reference to Creme de Menthe is because of the sporadic and possibly drunken/ill-defined highlights of green in the necktie . . . or perhaps it refers to the condition of the artist (and the guilty libation) when the necktie was designed . . . or perhaps I’m just over thinking the title . . . ah, what fun! The tie looks really great with my festive red shirt. And, it doesn’t look too bad with my holiday green shirt either. With such colorful options in my closet, I can’t even imagine wearing this necktie with a plain white shirt, but it is always an option (I guess). I currently have ten (10) holiday neckties, two (2) of which are bow ties: a solid red one, and a green and red plaid one. So despite the short season, I do have plenty of options. If my collection continues to grow, I may reach the point where someday I would be able to wear a different holiday necktie for each work day between Thanksgiving and Christmas . . . heaven help me!